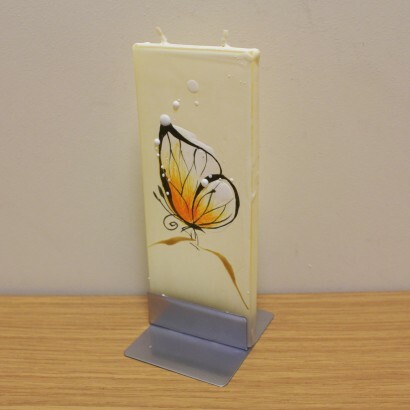 A contemporary wax candle with a pretty decorative design, this Flatyz candle features a delicate amber butterfly design that's weaved with gold for a warm, luxurious feel. Complete with a stand, Flatyz candles have a unique "flat" design with a depth of just 0.6cm and a double wick for uniform burning. Stand in the holder included for an unusual, stylish candle and unique decoration.